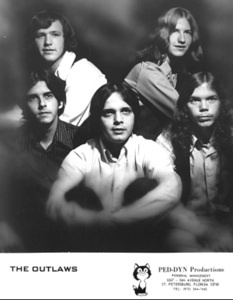 The Outlaws sometime between 1969 and 1972. 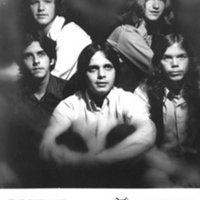 This photograph features, from left to right, guitarist Hughie Thomasson and drummer Monte Yoho in the back, as well as bassist/guitarist Frank O'Keefe, guitarist Herbie Pino, and guitarist/keyboardist Billy Jones in the front row. At the bottom is the band's name and management information, which includes a cartoon logo for Ped-Dyn Productions and contact information. Formed in Tampa, Florida, in 1967 by guitarist and lead vocalist, Hugh "Hughie" Edward Thomasson, Jr., The Outlaws peaked in popularity in the mid-to-late 1970s, with hits such as "Green Grass and High Tides," "There Goes Another Love Song," and "(Ghost) Riders in the Sky." Known by fans as "The Florida Guitar Army," the band's three-part harmonies distinguished them from their Southern rock contemporaries. The band experienced more personnel changes than most musical groups, with at least 45 different members between 1967 and 2015. Original black and white photograph: Profiles: Bands & Artists, Tampa Bay Music Scene Historical Society. Digital reproduction of Original black and white photograph. http://www.tampabaymusichistory.com/resources/EARLY%20OUTLAWS.jpg. Smith, Michael Buffalo. Rebel Yell: An Oral History of Southern Rock. 2014. Bomar, Scott B., and Doug Gray. Southbound: An Illustrated History of Southern Rock. 2014. “Hugh "Hughie" Edwards Thomasson, Jr., Monte Yoho, Frank O'Keefe, Herbie Pino, and Billy Jones of The Outlaws.” RICHES of Central Florida accessed April 20, 2019, https://richesmi.cah.ucf.edu/omeka/items/show/5472.